Good morning, my Thursday friends. 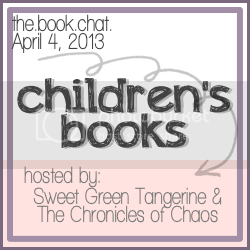 It's Book Chat day and today's topic is...Children's Books. I think we have discussed books from our childhood before, but we're going to have to recycle topics here and there. Plus, we've had some newcomers join in since, so it makes sense to throw some repeats in there. One of those newcomers (even though she's not really new anymore) is Mia of The Chronicles of Chaos. I remember being super excited when Mia joined the book chat party because she is A) a killer blogger and B) a fun, down-to-earth, relatable Mom like myself. And today's she's co-hosting! As for today's topic...I have wanted to include the kids in on the book reviews for a while now. 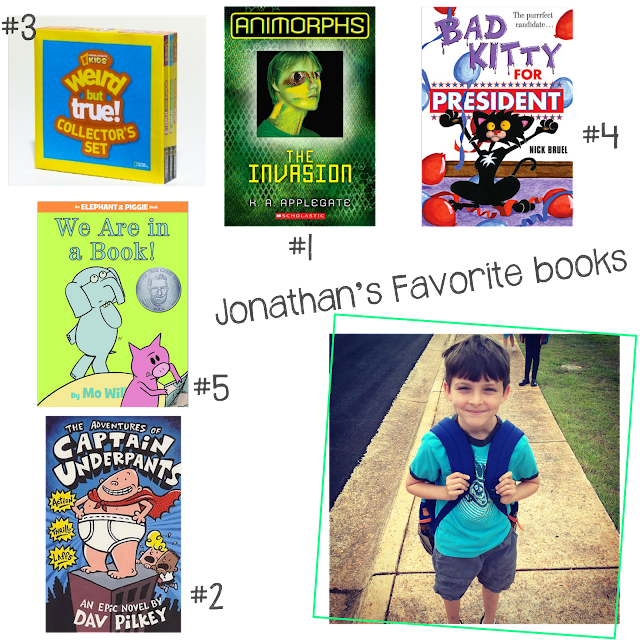 I'm always wanting to share the boys' favorite books. We get a lot from the library and spend a lot of free time at Barnes & Noble so I'm always thinking of sharing the good ones I find. Me: How did you feel about The Magic Treehouse? Jonathan: It had a T-Rex. If you have or know a 7 year old, then you know that this is pretty typical. I don't know what I was expecting. Bless his heart. Jude has recently gotten to that age when he can sit and listen to books now. 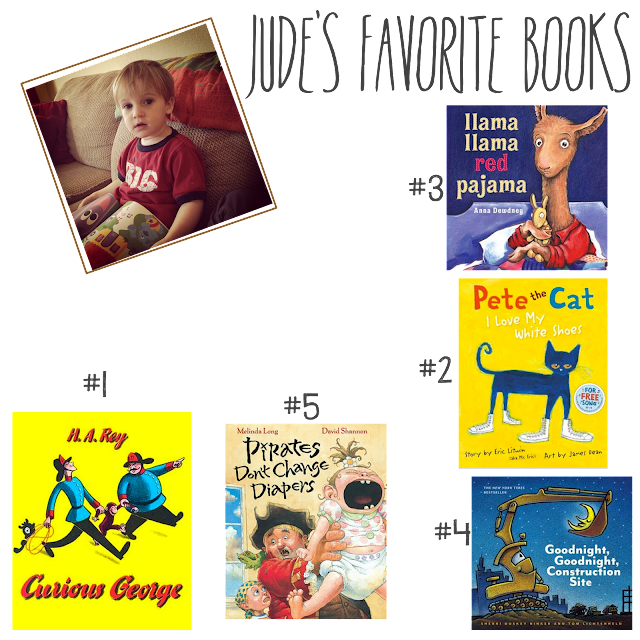 His favorites are ones with characters he recognizes like Curious George and Llama Llama. And he loves the rhyming, musical lines in Pete the Cat. I love that he requests books by name now. He's majorly obsessed with Curious George right now, which I love because the television show is educational, but not in a n obvious, demeaning way. He's never been a fan of those shows. He laughs at almost every page in the books, which I just love. Honestly, I hate reading the Pirates book, but he loves it. The drawings are detailed and stimulating. And honestly, who doesn't love Llama Llama? If you have a little boy in your life, you need these books. Llama and his Mama melt my heart. Jonathan is just starting with the chapter books and these are a couple of his favorites. His favorite reads tend to be ones with humor or action. Captain Underpants is ridiculous, but entertaining enough to keep his interest. Bad Kitty is a favorite of mine because some of the humor is over his head but enjoyable for me. Most of the time, I'm sitting with him while he reads, but I try not to help too much. Animorphs was a series we started last year and it was way over his head, but I read them to him. We got through three whole books in the series which was a big accomplishment. I was impressed that he could keep up with the characters and plot. As for Elephant & Piggie, if you have not discovered Mo Willems yet, and you have little ones, go get one of his many books now. His books are always funny, unique and a bit abstract or metaphorical. It's subtle, but it makes a difference, I think. And if you have a science lover, I recommend Weird But True books. They are fascinating. We keep one in the car, and even though we've read every page, it's fun to rediscover all of the strange truths within the book. Those are my boys' favorites. I love that they love books and even though they don't always love the ones I want them to, I'm just glad they have an independent mind to make their own choices. I hope they never stop reading and one day grow up to love it as much as I do. What do your kids love to read? Or what did you love to read as a kid? Penny loveloveloves to read books. We read her entire collection every day. It's ridiculous sometimes lol. But I go along with it! She runs to her bookshelf, grabs a book, throws it in my lap and sits down! If I don't start reading right away she throws a fit. My boys love Goodnight, Goodnight Construction Site! It came in our last book order and Mason carried it around for the longest time. I didn't notice until my oldest started reading on her own how much boys and girls interest in books differ. When they were all "little" they all liked the same books but as they get older books become more "boy" or more "girl" and they begin to like different ones. Love this! 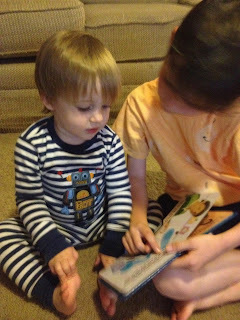 Captain Underpants is silly, but I am all for anything that gets kids interested in reading. Oh, I TOTALLY forgot about the magic treehouse books. I worked as a reading coordinator this summer(I basically got to be a librarian/reading teacher for a day camp for 2 months, and it was awesome), and the books I recommended to my kids the most were the magic treehouse books and the Wayside series. The most popular book, though, was a dinosaur pop-up book called Snappy Little Dinosaurs. Even the 6th graders wanted to read it. the Gerald and Piggie books are cute! I used to read Curious George as a kid AND Captain Underpants. It's so silly. Actually LOVE this post, so sad I didn't have time to link up. Working in the kid's section at work, I constantly get to read kid's books. I love all of Jude's faves, and Johnathan's too! I read Animorphs as a kid, actually. And the Weird but True?! Those have kept me busy MANY times on long shifts, haha!